Butuan City — The Department of Health (DOH) Caraga Regional Office here, announced that two provinces in Caraga Region will soon be declared malaria free and they are closer to achieving their goal of malaria free for the five provinces of the region. “We already have three provinces here in Caraga Region that has been declared malaria free, they are the provinces of Surigao del Norte, Surigao del Sur, and the island province of Dinagat. We are optimistic that soon the provinces of Agusan del Sur and Agusan del Norte will also be declared malaria free,” said Erna T. Cravajal, regional malaria coordinator of DOH Caraga. 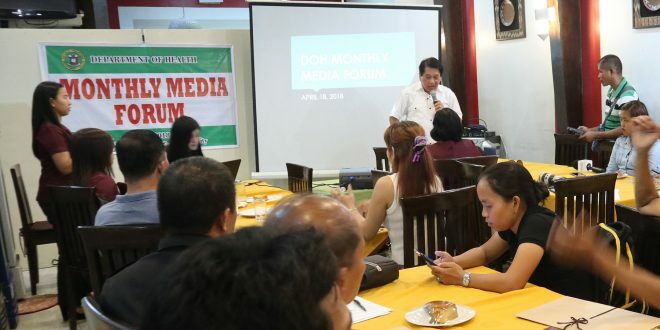 Cravajal stated that they are optimistic that soon the remaining provinces of Agusan del Norte and Agusan del Sur will also be declared malaria free. “We have two provinces remaining for elimination of malaria, Agusan del Sur will be assessed this coming May 8 to 11 by the technical working group from the central office and then Agusan del Norte will be assessed next year if there will be no reported indigenous case,” said Cravajal. Records from the DOH Caraga suggest that the last reported case of malaria was in 2013 in barangay Mahaba in Cabadbaran City. “Before a province can be eligible and could be considered for the validation and investigation from the technical working group of the malaria control and elimination program from the central office, the province must have the span of five years without any reported indigenous case of malaria. Indigenous, meaning it should be coming from the locality and not from someone travelling and bringing the case to our provinces,” she said. Data from the DOH reveal that seven provinces still have reported endemic cases of malaria, with Palawan with the highest number of cases, followed by Davao del Norte, Sulu, Sultan Kudarat, Davao del Sur, Maguindanao, and Occidental Mindoro.